For this year’s Community Connection event, SVALA will support the Mended Little Hearts of Sacramento’s Courageous Heart 5K & Fun Run by manning the event’s registration check-in booth. The Fun Run will be held on October 6, 2018 at Johnson Springview Park (5480 5th Street, Rocklin, CA 95677) and volunteers are needed starting at 7 a.m. Attached please find a flyer that details the volunteer opportunity. The Courageous Heart 5K & Fun Run is a family friendly event to fundraise for and support children and families impacted by Congenital Heart Disease. 1 in 110 babies are born with Congenital Heart Disease each year. Mended Little Hearts of Sacramento’s goal is to raise money for bravery bags for all children staying in local hospitals who are undergoing open heart surgeries. Bravery bags include books, stuffed animals, toiletries, goodies, snacks and miscellaneous items so that the children and families can have some kind of normalcy and support in the hospital during their pediatric intensive stay. All volunteers for the event will receive a t-shirt so they are easily identifiable to the participants. If you have any family members or friends who would like to volunteer at the event, please email their name and t-shirt size along with yours when you RSVP. Mended Little Hearts of Sacramento is a non-profit organization. For those who personally or whose firms would like to make a tax-deductible donation, please make the checks payable to Mended Little Hearts of Sacramento (Federal Tax ID: 04-6073589), and send to Huguenin Kahn LLP, 3741 Douglas Boulevard, Suite 290, Roseville, CA 95661, Attn: Diane Tofft. SVALA will present the checks to the organization at the end of the event. Your support of this worthy cause is greatly appreciated. If you should have any questions, please do not hesitate to contact me. This year we volunteered our time and energy staffing the Walk to End Alzheimer’s registration tables. We had 23 volunteers including: 12 members; 8 guests; 2 business partners (Jenoa with U.S. Legal and Richard with Pacific Storage), and; 1 business partner’s spouse (Richard’s wife Lora). Along with a few other event volunteers we registered just under 3,000 walkers!!! The Walk started at 10:00, we arrived at 7:00 and began registering walkers at 8:00. A very busy 2 hours! As I registered each walker I tried to be in the moment and thank each participant, maybe that’s why our table had such a long line! Silliness aside, the warmth in each participant’s eyes was extraordinary. Some families walked together and several young people proudly said they were walking because a family member has/had Alzheimer’s. There were also smiles from teenagers when thanking them for getting up early. Law firm donations totaled $2,150 and the chapter added $600 for a total donation of $2,750! Whether by donating time or money or both – thank you participants!! SVALA’s Community Connection Event to support the Diabetic Youth Foundation was held at Dave and Buster’s on November 10, 2012. 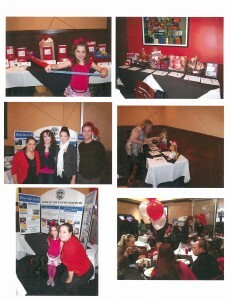 The event was well attended and the raffle and silent auction were successful. The goal was to raise enough donations to cover new signs and long distance radios for DYF’s Bearskin Meadow Camp. Diane Tofft, Event Chair, reported that we far exceeded our goal. We raised $8,234 for this event. 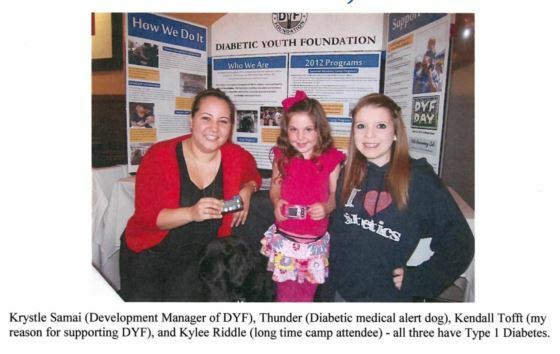 The event cost was $1,276.87, $220 for power cards, and our cost for the signs was $245 (the labor was donated by David Carlson Construction) leaving a total cash donation to Diabetes Youth Foundation of $6,492.13! The funds remaining after the purchase of the long distance radios, approximately $4,600, will go toward scholarships for children who would not otherwise be able to attend Bearskin Meadow Camp. Thank you for everyone’s support for this special cause! 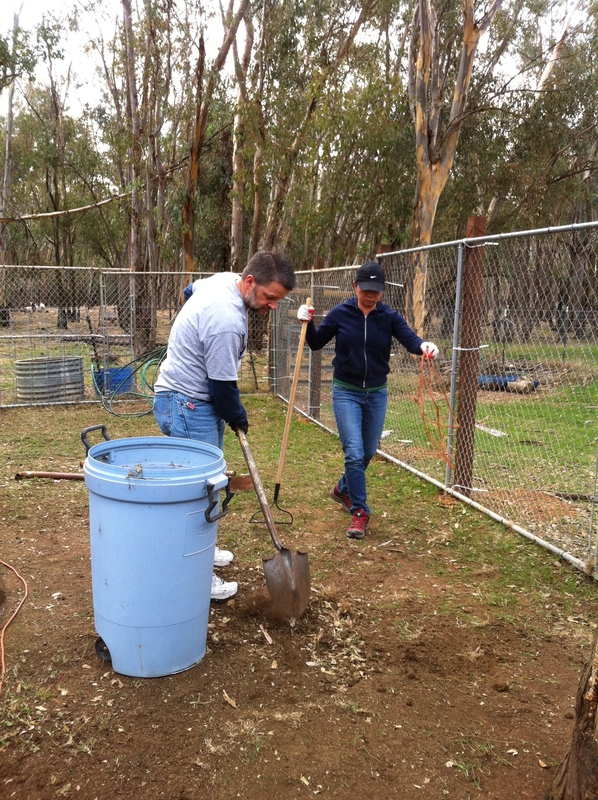 On November 5th, 35 members, vendors and friends of the Sacramento Valley Chapter got together to repair and clean up kennels for the Central California Labrador Retriever Rescue (CCLRR). All labs rescued from shelters must be quarantined for kennel cough before going to foster homes. 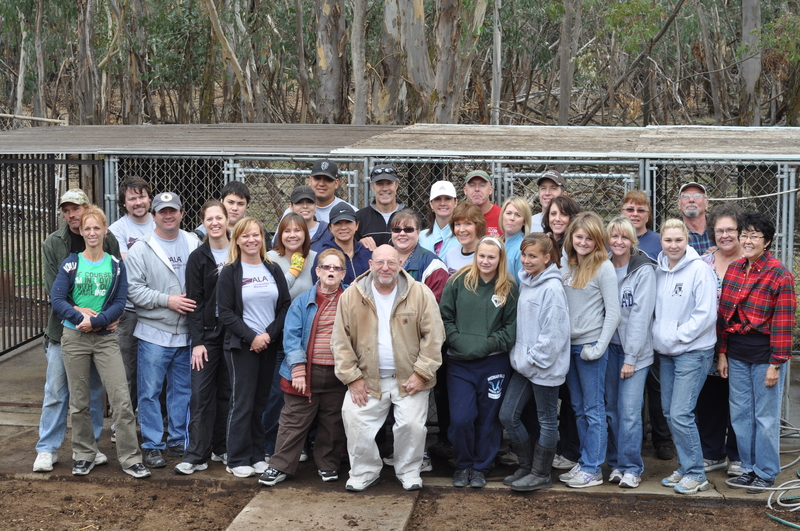 CCLRR had six roofed kennels they could not utilize as they were in need of major clean up and repair to the roof and exterior fences. 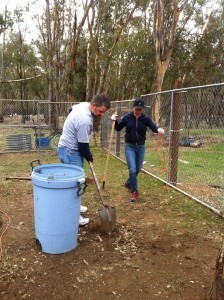 There was a lot of hard work and lots of goat poop to be cleared!! We filled a whole dumpster with debris, cleared the area, power washed the kennels, and repaired the roof. 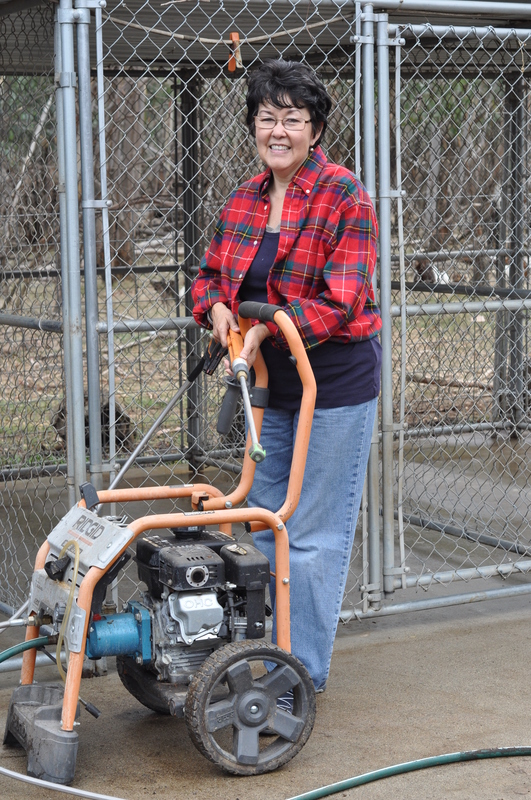 We then put mesh around the kennels to cut down the cold breezes and affixed barriers between the kennels. The transformation was amazing. The CCLRR is an all volunteer organization which was founded in 1998 to find loving homes for abused, abandoned or unwanted Labrador Retrievers in the Central Valley. In 2010 they brought in 426 labs in need of new homes; this year they’ve had a lab with a broken leg, one with a disconnected kneecap, three dogs with ACL injuries, two heartworm positive dogs, a dog hit by a car with a severely lacerated leg, several females used for breeding who were dumped because of age and a pregnant lab left at the shelter where she gave birth to 7 puppies (only 1 survived and mom is fighting for her life). In addition to making the kennels habitable, we were able to donate $3,000 to the rescue thanks to our business partner sponsor, SourceCorp, as well as donations from several law firms and the Chapter, so the CCLRR can continue to help our four-legged friends who cannot help themselves. Please consider the CCLRR for your adoption needs. They have so many adorable labs available that would not be with us if not for their dedication. 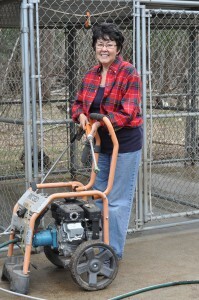 Go here to see an article about SVALA on their website and the labs they have available: http://www.ccabrescue.org/available_list.php . 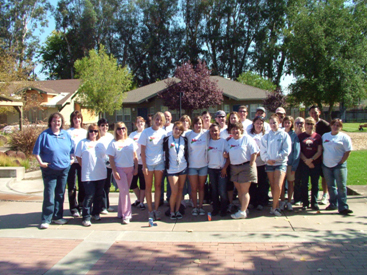 For the October 2010 Community Challenge Weekend, the Sacramento Valley Association of Legal Administrators wanted to reach out to a local school with needs in light of cuts in education. Camellia Basic Elementary School was chosen from a number of school applicants explaining why they should be the beneficiary of the Chapter’s funds and labor. 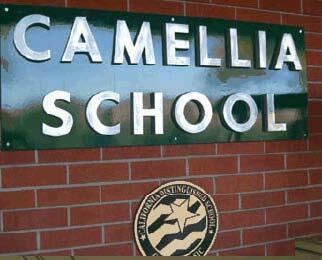 This year, Camellia School celebrated its fiftieth anniversary. Fifty years ago, Camellia was among the worse elementary schools in the State. As a result of dedication by its principal, teachers and parents, Camellia proudly supports numerous banners of achievement. Of particular pride is the Distinguished School Blue Ribbon Award earned in 2003 and again in 2010. 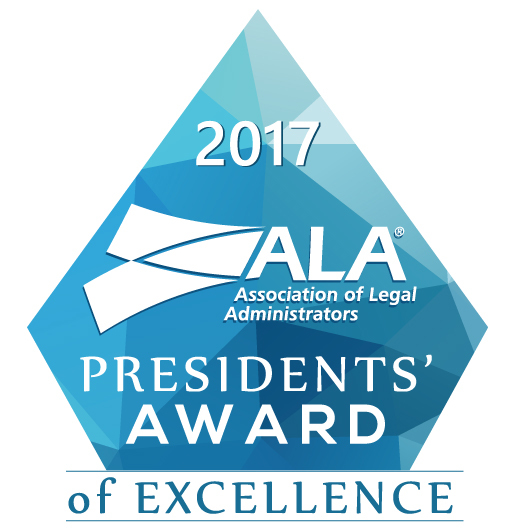 This award only goes to five schools in California and about 200 schools Nationwide. This is considered to be an outstanding accomplishment, given that 70% of the students are English language learners. Given the wish list the school presented, we made our theme fighting childhood obesity through physical activity and fitness. We were able to help a well-deserved school install shelving in the athletic equipment room to more efficiently implement their P.E. 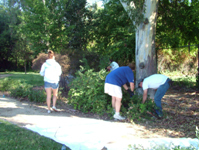 program, beautify the school playground areas with flowers, shrubs and cedar bark and participated win getting them ready for their Halloween carnival. The school’s desire and this year on of the missions of Sacramento City Unified School District is to make the school grounds neighborhood-friendly and accessible to kids on weekends and during summer vacation. We were able to contribute to that goal by planting flowers, shrubs, spreading cedar chips around trees, painting sidewalks and build shelving. Many of the volunteers had fun painting Halloween carnival game booths and organizing prizes for the event. Altogether, it was more than rewarding for those of us who attended. We could not have accomplished this without the monetary donations, labor and enthusiasm of our Chapter volunteers, firms and vendors Gallaway Commercial Inc., John Woodall of Lyon Real Estate and Jim Pinter of First Legal Network. We specifically chose to link Community Challenge Weekend with the School’s gardening day. All totaled with parents, students and our wonderful volunteers, we have over 60 people attending to the school ground needs. Thanks to the generous hearts of some local businesses (Safeway, Starbucks, Welco Market and Sierra Springs Water), we had coffee and ate a healthy breakfast of fruit, yogurt and granola bars (compliments of Jim Pinter at First Legal Network) and had a delicious Chinese lunch (with vegetables, of course). As an added treat for the parents and children, Starbucks donated a gift bag for which we had a drawing. 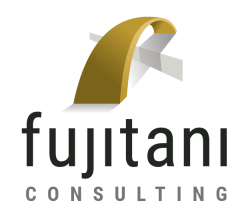 With monetary contributions from local firms and the Chapter, we accomplished our goals! Special thanks to Cynthia Fulkerson, Cindy Cintas Pilon, Kathy Davidson-Brown and Dottie Noble for serving on the CCW committee this year. 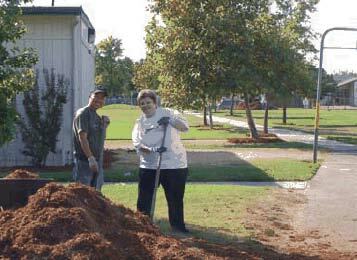 It was also a pleasure working with Kathy Kingsbury, Principal, and John Avila, School Plant Manger, of Camellia School. Of course, we cannot emphasize too much that we could not have done this without the donations from Kronick Moskovitz Tiedemann & Girard, Somach Simmons & Dunn, Murphy Austin Adams Schoenfeld LLP, Olson, Hagel & Fishburn, Best Best & Krieger, Boutin Jones Inc. and Resources Law Group. Thank you to all who came out and gave your time, energy and smiles to the day. 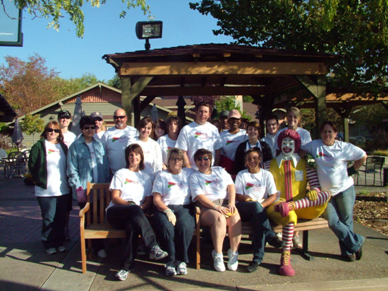 On October 10, 2009, SVALA members and their co-workers, family and friends came out for our Community Challenge Weekend (CCW) in support of the Sacramento Ronald McDonald House (RMDH). RMDH is a nonprofit organization whose mission is to help children and their families by providing a place for them to rest, reflect, and find mutual support while their children are receiving medical help. Families who stay at the Sacramento RMDH have children staying or having treatment at local hospitals such as Shriners or UC Med Center. The House provides for them a refuge from the hospital setting. The weather was wonderful, making it a perfect day for outside work. To get fueled up and ready-to-go, volunteers started off by enjoying great coffee donated by Starbucks and delicious pastries. This year, part of CCW was the collection of Pop Tabs, which were donated by local firms, family and friends of SVALA members. Pop Tabs were taken off the top of aluminum cans and dropped into Ronald McDonald donation containers. Two pounds of Pop Tabs were collected! 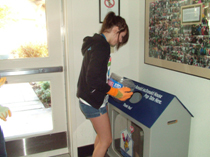 RMDH earns up to $10,000 annually with the donation of Pop Tabs. What an easy and fun way to help out; every Pop Tab helps! Lunch was served, and delicious sandwiches were provided by Mirepoix Catering. Fruit and chips were donated by Jeaninne, and to top it off, beautiful and very tasty cupcakes were donated by Cupcake Cravings. This year, SVALA collected $2,325.00 in donations from local firms, businesses and private individuals, which will be presented to the Ronald McDonald House. I want to personally thank all of you who took time out of your weekend to join our team in support of this wonderful cause. Thank you to Ron Ross who did a great job on our team t-shirts. 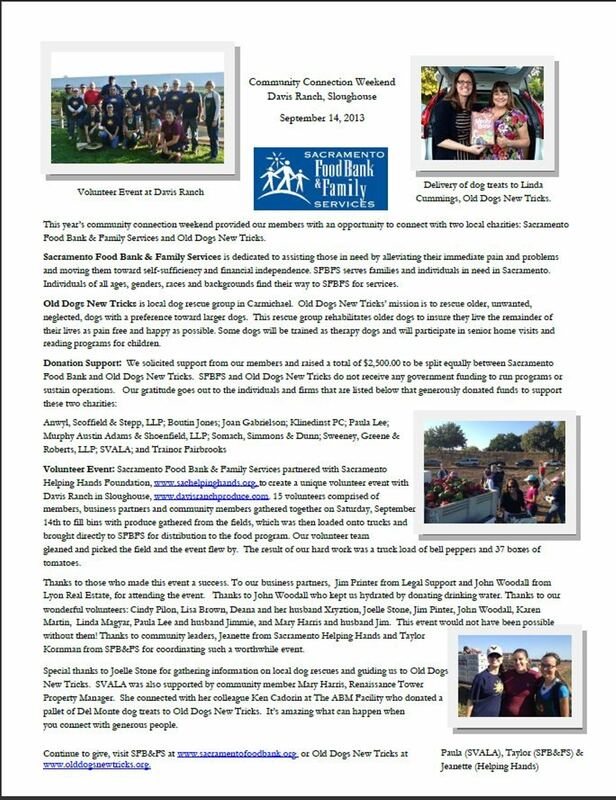 A big “thank you” to the following businesses that made monetary contributions: Abbott & Kindermann LLP; Anwyl, Scoffield & Steep, Boutin Gibson Di Giusto Hodell Inc.; Hardy, Erich Brown & Wilson; Kirk Arthur Royal Hair Design; Murphy Austin Adams Schoenfeld LLP, Resources Law Group LLP; and Trainor Fairbrook. 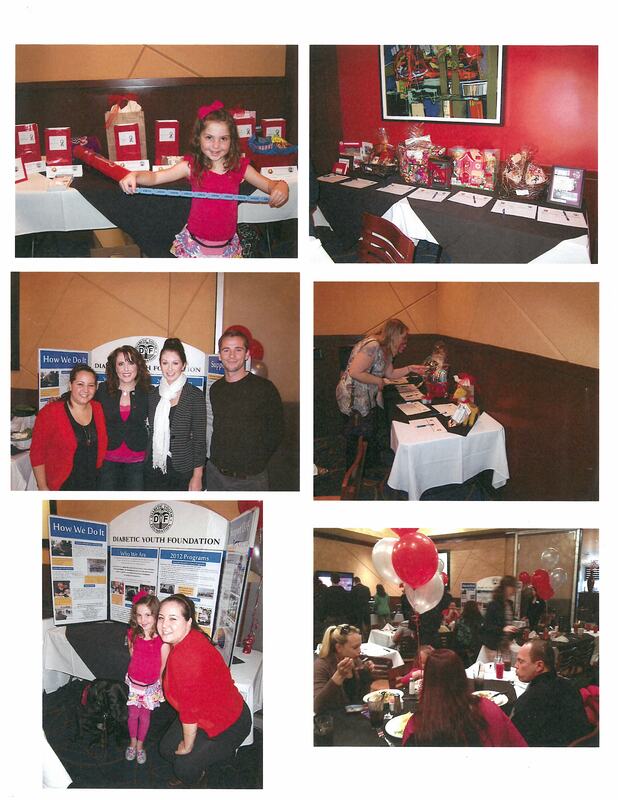 The 2009 CCW was a great success and we look forward to seeing you next year! Copyright 2009 Sacramento Valley Chapter - Association of Legal Administrators, All Rights Reserved.